Stripe is one of the most popular payment merchants for web, but information about Laravel integration is pretty fragmented, so I decided to write a really long tutorial about this topic. 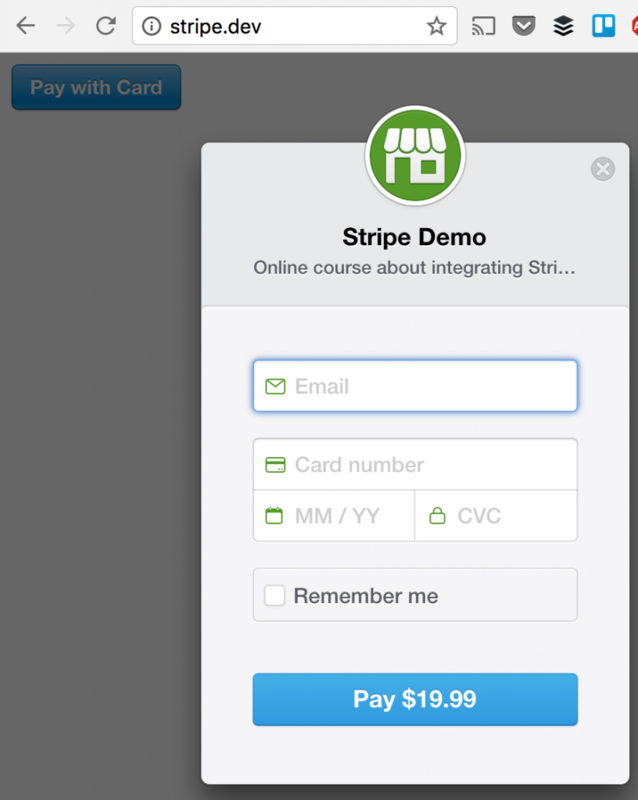 Stripe is a system to accept payments via credit cards. 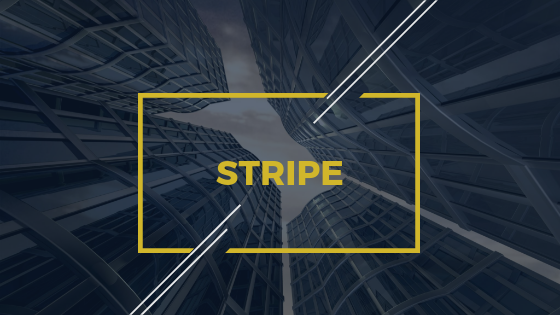 Instead of you handling all the security compliance and banking transactions, Stripe does it for you, while taking a small percentage for that. The most basic implementation is called Stripe Checkout. 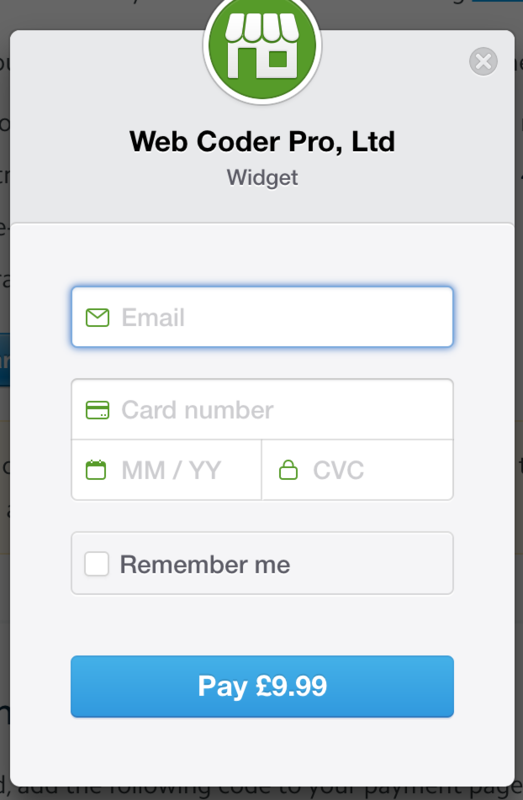 User enters Credit Card details on your page via modal. AJAX call is made to Stripe server for checking the credit card. If the card is accepted, Stripe returns a unique token which represents that card for all future reference from your application, so you don’t actually ever store card details in your database (which is really important from legal perspective). Then you can call Stripe servers again to actually charge the card, referencing with the token from Step 3 – one time or for recurrent payments. There are more events, like processing errors, storing customer details in Stripe database, processing refunds and more, but these are the basics you need to know for now. Now, let’s cover those steps in more details, with a sample application. composer create-project laravel/laravel --prefer-dist . Next step – we replace our homepage, which is located in resources/views/welcome.blade.php, with Stripe code from their official documentation. data-description="Online course about integrating Stripe"
There is one important field we need to discuss separately – called data-key. Which means – how do we identify that this is our Stripe account and not someone else’s. To authenticate, Stripe gives you two pairs of credentials, so-called Publishable and Secret key – both for testing version (starting with xx_test_xxxxx) and for live version (starting with xx_live_xxxxx). You can find them under API section in your dashboard, see below. So we need to put one pair into our code, depending on whether you’re testing the payment, or want to accept real money from real credit cards on live environment. Another benefit of this is that we could use one .env file for our local/staging environment, for testing, and separate .env on production server with live credentials. Notice: I’ve hidden some characters under xxxxxxx, your credentials should be different. In a few minutes, I will explain where the Secret key is actually used, stick with me. 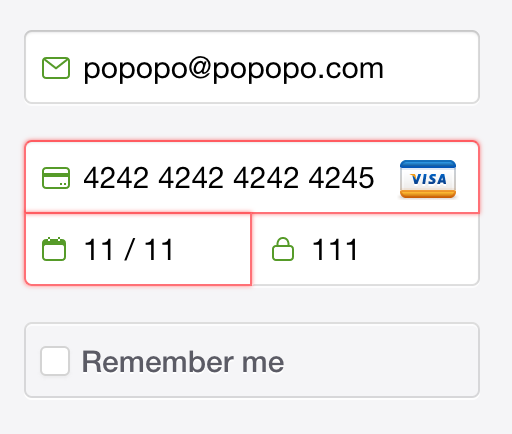 Ok, now we have the form showing up, but what happens if we actually fill in credit card details and click Pay? 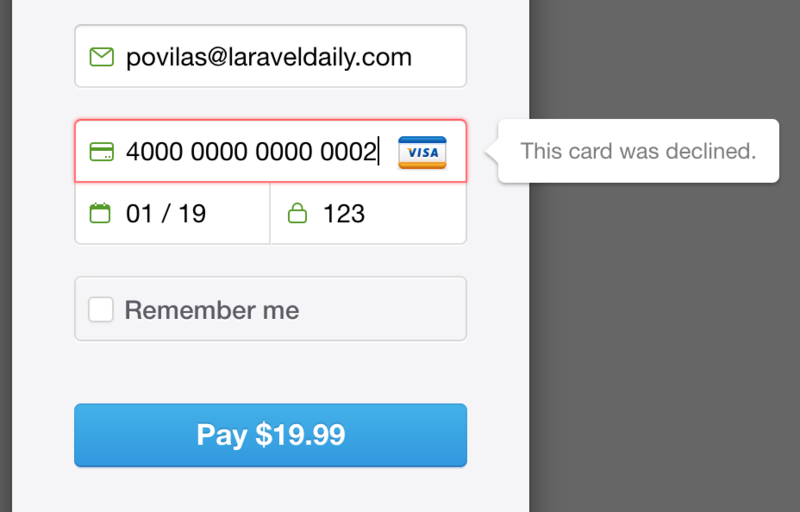 The best thing here is that we don’t need to take care of every possible error with the card – Stripe shows the actual error text immediately within that modal window. Now, enough about errors: how do we know what “correct” details to enter for testing, how do we “fake” credit card? And this is where we have a problem – our /your-server-side-code does not exist yet! Let’s create a route and controller for the actual checkout. Now we can actually use this token to charge this card. 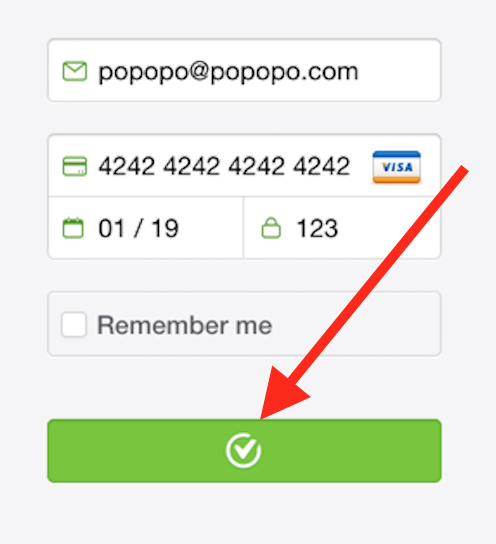 Remember – we don’t have card details and we operate only with token, returned from Stripe. Notice: this package is framework agnostic and can be used for any PHP framework or even with plain PHP. Let’s analyze it bit by bit. Alternatively, you can use them with full path in the code, like \Stripe\Customer::create(…). Next, we initialize Stripe package by passing our secret key as a parameter (remember I told you it would be useful). 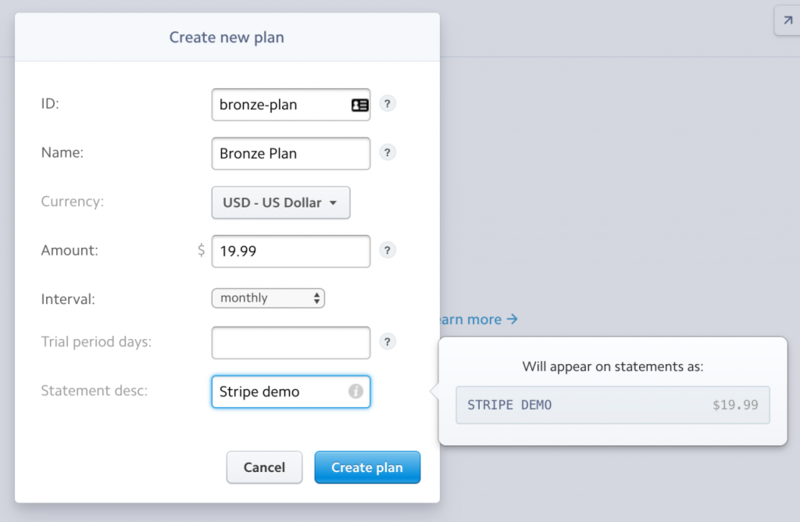 Next step – we need to create a customer in Stripe system, only then we can charge them. 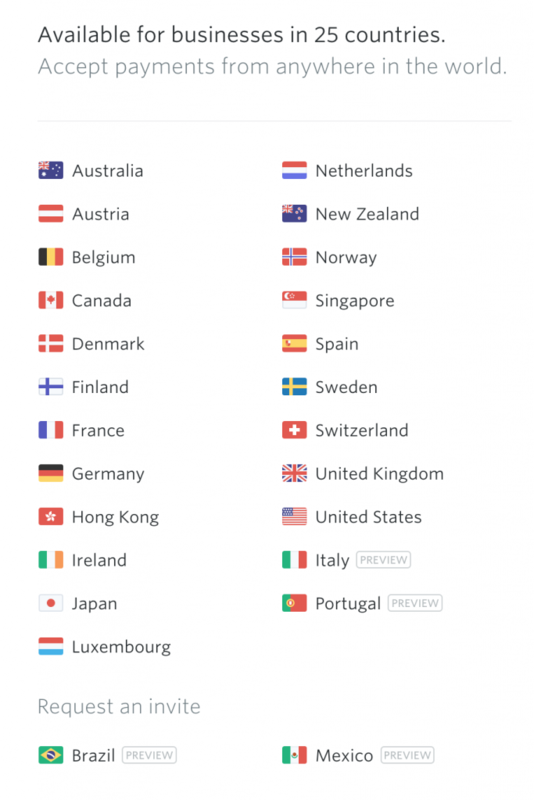 And, here’s what Stripe dashboard shows – yay, success! 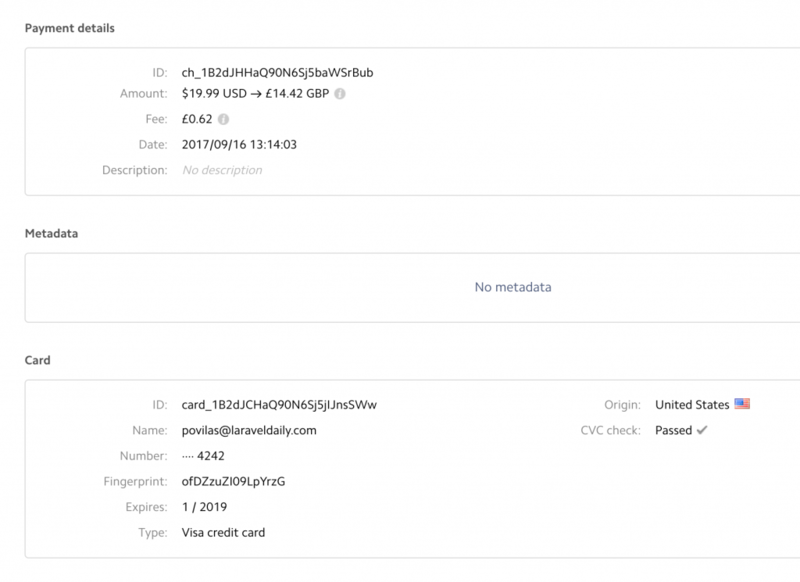 Notice: You may see currency change to GBP, cause my business (and Stripe account) is based in UK. Ok, so basically, we’re done with quickest Stripe Checkout integration. Quite easy, isn’t it? Up until now we were talking about one-time payments for a particular product. But there are a lot of cases for subscription-based businesses, where cards should be charged monthly or yearly. Let’s see how to do that. First, you can process it manually. So you can store credit card token and/or Stripe Customer ID in your database (but don’t store credit card details, it’s against the law in 99.99% cases), and then every month have some kind of a cron job to call Charge::create again. But there’s a better, more convenient way – to use official package called Laravel Cashier. Then we can reference this plan to assign it to customers. Now, run php artisan migrate. Also, for testing purposes, I’ve created a seeder for one user. And we run php artisan db:seed. Ok, now we’re ready to actually start charging our customers. With almost the same form. And now – the main thing: actually processing the data. Here’s the result in Stripe dashboard. And our database looks like this. Since we’re working with payments, it would be logical to touch on invoices. 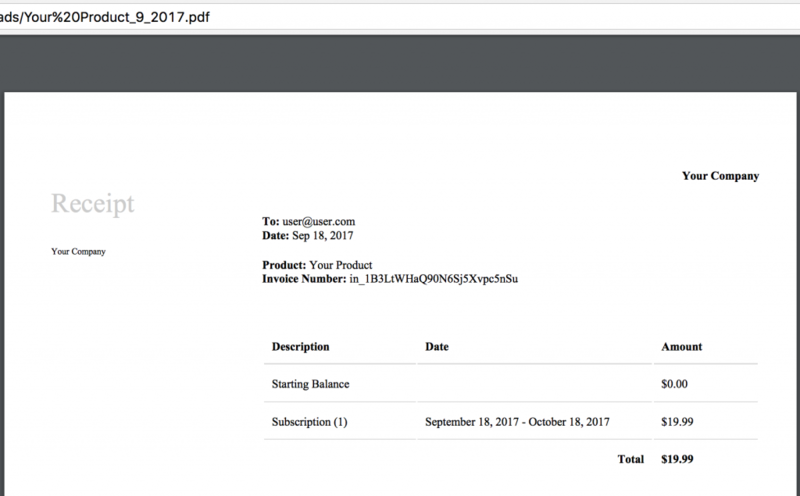 We’ve just covered subscriptions with Cashier, so this package also allows to view invoices data and even download PDFs really easily. Also, the list of invoices. But I assume you would like to customize that invoice. It’s also pretty easy. The view for this PDF is referred as View::make(‘cashier::receipt’), so to access and edit this file, we need to run php artisan vendor:publish for Cashier package. Offtopic: awesome, recently-released Laravel 5.5 now asks what to publish, cool! And then you will have file resources/views/vendor/cashier/receipt.blade.php and feel free to customize it however you want! 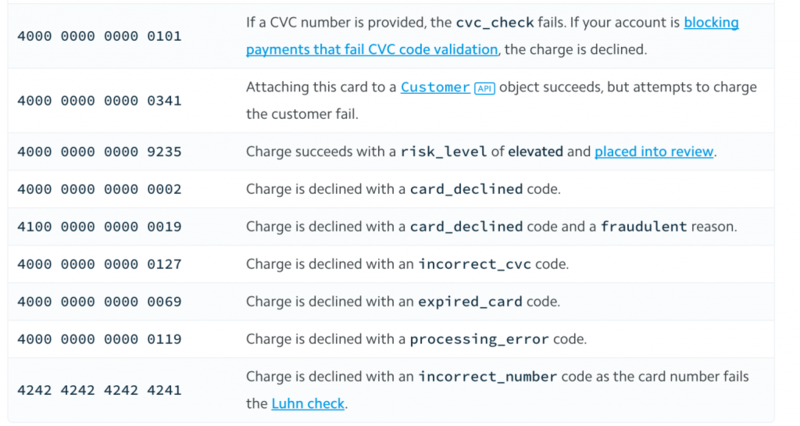 So if you want to have invoices for simple charges or Stripe Checkout, you would have to build that logic yourself. You can actually re-use Laravel Cashier logic and code to some extent, but it’s still manual work. That’s it for this big tutorial. Hopefully you will be able to adapt Stripe in your Laravel apps now, and understand some parts a little deeper. If you want to play around with the code I’ve written here, I’ve prepared an archive for download. And you may be interested in QuickAdminPanel – our Laravel admin panel generator, where Stripe integration is one of pre-built modules. Anything I’ve missed? Hit me in the comments! How to implement multiple models with the Billable trait? For example, I also need when creating a job post the user needs to pay for it monthly for each. Thanks for the question, Yaeykay. I don’t understand why you need multiple models – the charge still belongs to USER, right? Doesn’t matter if it’s job post or some other action, user is charged. Well, it’s not technically one time charge since every job post will be billed monthly, so I guess it’s a subscription for a job post? Yes, so it’s a subscription, but for a USER. So I don’t see why $user->newSubscription() wouldn’t work. How can I check if the job post is expired or not? $user->newSubscription() creates record in subscription table that belongs to a user and not job post? He has USERS and JOBS, 1 User -> n Jobs. Users can subscribe for n jobs, so users can have a lot of subscriptions with different end dates (for each job). The subscription must be attached to job, or job_user for example, not to user. You can set your JOB model as “billable”. 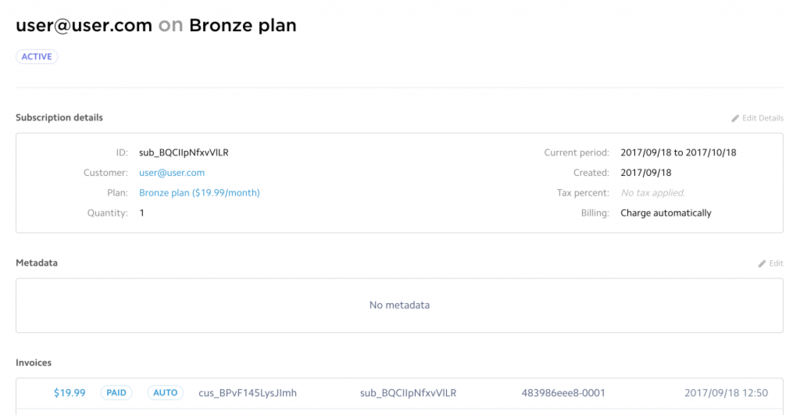 The payment will be associate to user, but the subscription (and the future renews) will be attached to each single job. I hope this will be helpful for new users. Thank you Povilas. I’ll try experimenting with that and see what I can come up with. Sorry, I’m not sure what is your database structure, and what it means that post is “expired”. You can check user’s subscription and then if the post is expired for today’s date? I guess, it all depends on your project structure. Nice tutorial will be using Laravel cashier in my next subscription based project. Excellent tutorial! Definitely bookmarking this for immediate implementation on a project! I ran into a snafu tho trying to install cashier. It wouldn’t install via composer command line. I had to add manually to composer.json and update. Very helpful article! Almost referred and implemented stripe! Hi, thanks for the info, it really helps to clarify the official documentation. My case is this: I have a company that pays the monthly fee and within that company several users can be created at any time. I verify if the plan is in day or not by the company and not by its users. Do you have any idea how I could proceed? Is there a way to change the field check in user to another in the company table? Thank you one more time. beautiful and excellent code for payment interation.. thanks a lot. it’s good tutorial. I followed it and was able to execute successfully. but when I am going to charge my customer, definitely customer has to deposit money into my account. you did not mention where customer deposited money . how can we withdraw money ? This was awesome tutorial classic and simple. Well some interface changes but works like a charm. Well one thing was before installing Cashier make sure you remove your Stripe from compose,json cuz the verison is mismatch and use cashier 8 and above.